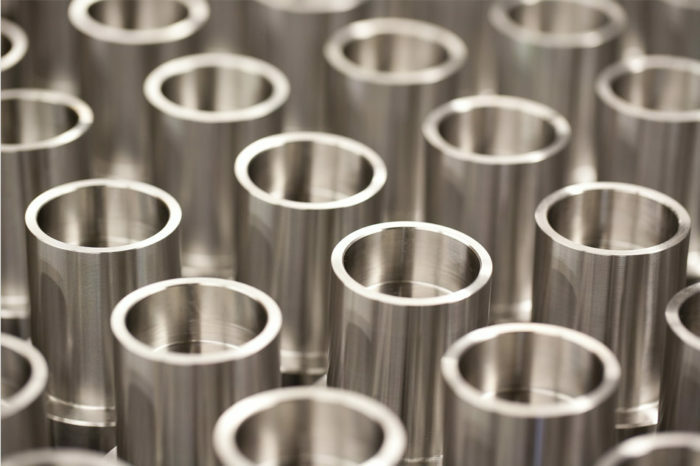 For over 55 years, S&H Machine has helped our customers increase profitability by reducing the cost of quality and by providing reliable solutions to their complex machining and sub-assembly needs. Founded by Albert “Bert” Stowers and Don Hazeltine. The business was first located at 6 West Burbank Boulevard in Burbank, California, occupying 2,000 square feet. CRANE Hydro-Aire becomes the primary customer of S&H Machine, a strong partnership that continues in the twenty-first century. Kenneth Fisher joins the company as a machinist. 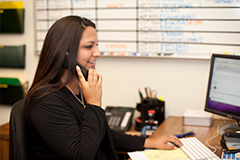 The business is incorporated in the State of California. The business moves to its present location at 900 North Lake Street, occupying 4,300 square feet of manufacturing space. 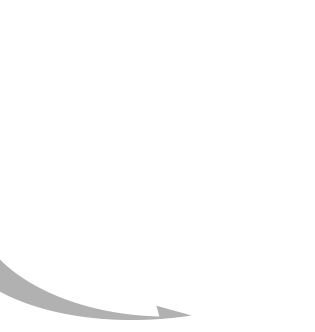 Bert Stowers sells his shares to his two sons, Keith and William Stowers, and to two key employees, Kenneth Fisher and Alfred Graham. The Corporation purchases the property at 900 North Lake Street. 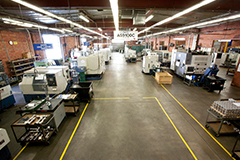 The company completes the purchase of it’s first Mori-Seiki CNC Lathes, an SL-1 and an SL-3. Kenneth Fisher becomes President of S&H Machine. 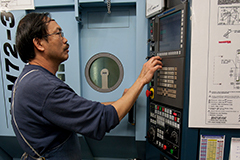 Dao Ha joins the company as a CNC Lathe machinist. 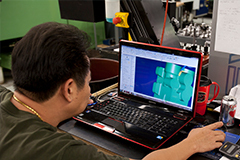 S&H invests nearly three quarters of a million dollars to significantly upgrade the technology in the shop, purchasing five new CNC machines and a Coordinate Measuring Machine (CMM). David Fisher joins the company and takes responsibility for the positions of Vice President, CFO, and Production Manager. S&H begins the creation of the database system that will run the company, now known as MAP. 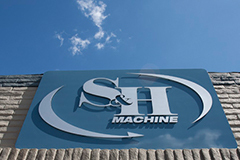 S&H Machine acquires the adjacent building at 830 North Lake Street, doubling the size of its facility to 8,600 square feet. S&H Machine receives its first order from Vickers Sterer Division, now Eaton Aerospace Hydraulic Systems, Los Angeles. S&H Machine becomes a Certified Supplier for CRANE Hydro-Aire and is given the authority to ship parts Dock-to-Stock. S&H Machine receives its first purchase order from Haskel International in Burbank, CA. S&H commits to a new foundation where solutions are delivered and customer success is our Mission! S&H Machine receives its first order from Pacific Scientific EMC/West, located in Chandler, AZ. S&H Machine purchases a new Mori Seiki SL-2500SY, a two-spindle CNC Lathe with live milling capability, utilizing a “Y” axis for advanced milling functionality. The machine significantly increases production capacity and cost effectiveness. S&H Machine receives its first order from L-3 Ocean Systems in Sylmar, CA. S&H Machine purchases a new Mori-Seiki SL-204MC CNC Lathe with Mill/Turn capability. Dao Ha becomes Vice-President of S&H. S&H Machine adds an additional 4,300 square feet by expanding into the adjacent building at 828 North Lake Street. S&H is the founding member of the Southern California Manufacturing Group (SCMG), a peer group of companies dedicated to improving their businesses in order to better serve their customers. S&H is the first machine shop in Southern California to begin using Net-Inspect, a Live Web-based Data Collection site, to record SPC. S&H Machine purchases two new pieces of Mori-Seiki equipment, an NV5000 CNC Mill with fifth axis capability, and an NL1500MC CNC Lathe with Mill / Turn capability. 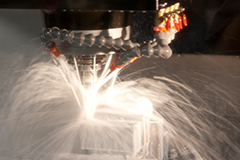 S&H Machine purchases a new Haas VF-4 Super High Speed CNC Mill with 4th axis capability. S&H Joins the National Tooling and Machining Association (NTMA). 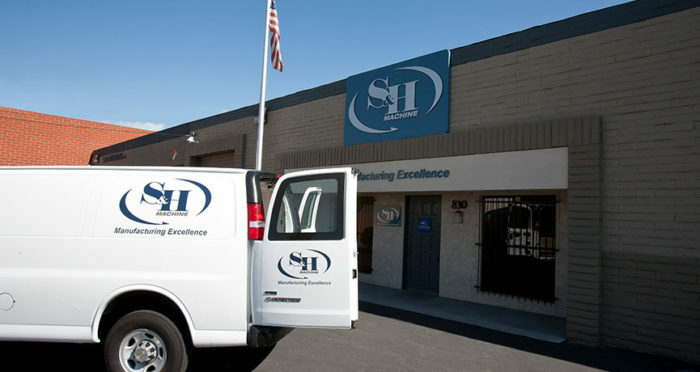 S&H receives its first order from HR Textron in Santa Clarita, CA (now Woodward Governor). Sales top $5 Million for the first time in the company’s history. S&H passes the initial AS9100 & ISO 9001 Registration Audit from Orion Registrar with no findings. S&H begins the journey to become Lean; David Fisher tours a World Class Lean facility in the Pacific Northwest and Sees the Light. S&H Machine purchases a new Mori-Seiki CL-2000 CNC Lathe. S&H Machine purchases a second Haas VF-4 Super High Speed CNC Mill with 4th axis capability, creating its first Cellular Machining environment. S&H Machine purchases a second Mori-Seiki NV5000 CNC Mill with fifth axis capability. S&H becomes a member of SEA, the Supplier Excellence Alliance. David Fisher and Sergio Solorzano receive diplomas in Lean Operations from The Tseng College at Cal State Northridge. S&H Machine adds an additional 4,350 square feet by expanding into the adjacent building at 826 N. Lake Street. Total square footage is now at 17,200. Richard Martin joins the company as Quality Manager and AS9100 Management Rep.
S&H achieves the highest Quality and On Time Delivery ratings in its history. As a result, S&H is presented with CRANE Hydro-Aire’s Certified Preferred Supplier Award and is also nominated as Eaton Aerospace’s Supplier of the Year! David Fisher becomes President of S&H Machine. S&H Machine receives its first purchase order from Whittaker Controls in North Hollywood, CA. S&H Machine creates a new Assembly area to support Sub-Assembly and Testing activities. 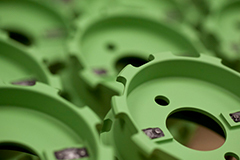 S&H Machine goes Green by investing in T-8 Lighting and water saving fixtures, and starts a recycling program. S&H receives the Certified Preferred Supplier Award from CRANE Hydro-Aire. S&H purchases an Amada HA250W CNC Band Saw. S&H Machine makes its largest single capital investment ever with the purchase of a Matsuura MAM 72-35V 5-axis Vertical Machining Center. S&H Machine receives its first purchase order from Esterline-Mason Controls in Sylmar, CA..
S&H Machine receives its first purchase order from Barry Controls Aerospace in North Hollywood, CA. 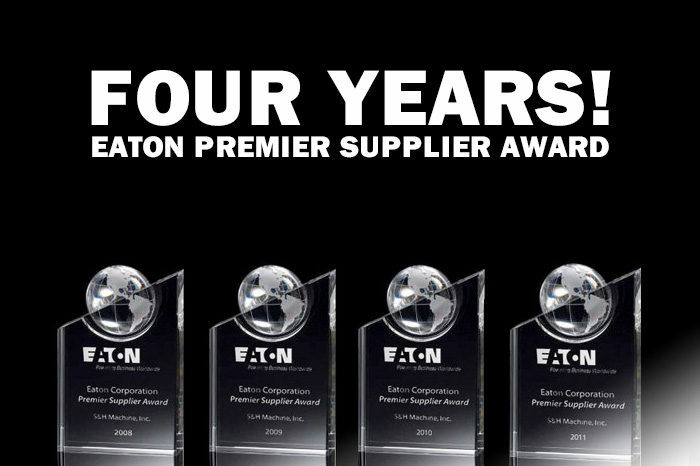 S&H is nominated as Eaton Aerospace’s Supplier of the Year! 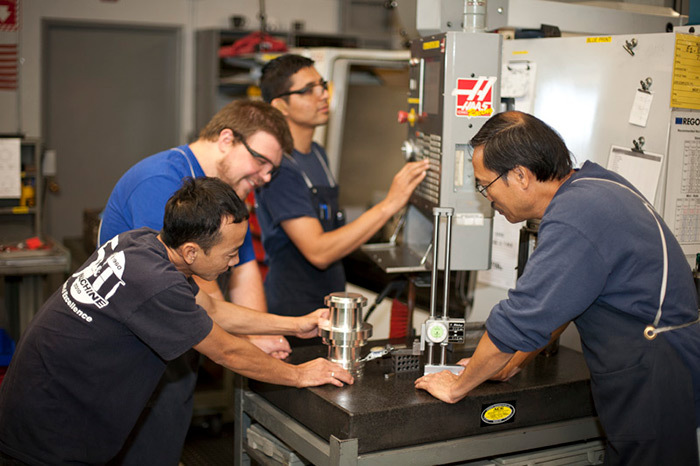 S&H Machine invests over 1,800 hours in Workforce Development. S&H receives the 2008 Premier Supplier Award from Eaton Corporation. One of only two suppliers out of four thousand candidates to receive this prestigious award, S&H achieves a Quality rating of 99.66% and an On Time Delivery rating of 97.74%. S&H receives its first purchase order from Applimotion, Incorporated. S&H receives the 2009 Premier Supplier Award from Eaton Corporation. This is the second year in a row that S&H has won this prestigious award, as they continue to set World Class levels of performance in Quality, On Time Delivery, and Value Added Services. S&H celebrates it’s 50th Anniversary! 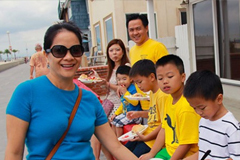 The event was held at the S&H campus and open to all employees and their families. Also in attendance were numerous repersentatives from the S&H customer base, their supply chain, and their esteemed group of business consultants. 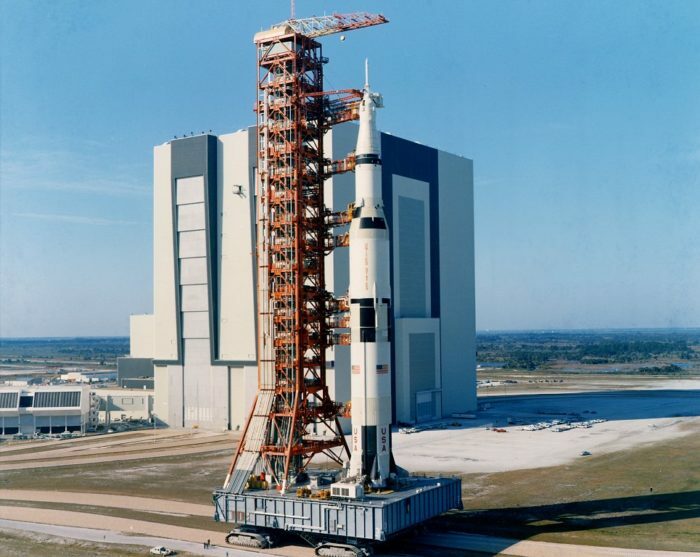 A special slide show commemorating the event was displayed, and David Fisher, President, gave an eloquent speech about the ascension of S&H into one of the most respected aerospace manufacturing facilities in Southern California. A special commendation was presented by Ron Kato, Site Leader of CRANE Aerospace Hydro-Aire, to David and Kenneth Fisher. The award was a blueprint of the very first part S&H manufactured for Hydro-Aire mounted onto a plaque, and celebrates the fifty-year relationship between the two companies. S&H takes delivery of its first 50-Taper work center, a Toyoda FV1365 Vertical Machining Center with a full 4th Axis Tsudokoma Rotary Table. S&H receives the 2010 Premier Supplier Award from Eaton Corporation. This is the third year in a row that S&H has won this prestigious award, as they continue to set World Class levels of performance in Quality, On Time Delivery, and Value Added Services. S&H receives its first purchase order from Esterline Advanced Sensors. S&H becomes an approved supplier to PARKER Aerospace, Fluid Systems Division. S&H receives its first purchase order from CIRCOR Aerospace. S&H purchases a dedicated company van for pickups and deliveries. S&H receives its first purchase order from MASS Systems. Sergio Solorzano is promoted to Quality Manager, and Alvaro Tenorio is promoted to Operations Manager. S&H receives its first purchase order from Canyon Engineering. S&H breaks the record for Annual Sales, eclipsing the mark set in 2008! S&H completes construction of a new Inspection Room in Building 4. The room measures approximately 1,100 square feet, includes temperature controls and will allow expansion of the companies Inspection capabilities. S&H completes the installation of their first Brown & Sharpe DCC CMM! The Global Line technology combines cutting-edge mechanical innovations, state-of-the-art motion controllers, advanced temperature compensation and PC DMIS, the world’s most popular and advanced metrology software. S&H surpasses $6,000,000.00 in annual sales for the first time in its history! S&H takes delivery of a Mori-Seiki DMG DuraVertical 635 eco 3-axis Vertical Machining Center. S&H ends the year with $7,500,000.00 in annual sales continuing our extraordinary growth. S&H takes delivery of a Mori-Seiki DuraTurn 2050 CNC Turning Center. S&H receives its first purchase order from Eaton Aerospace Jackson Fluid Power in Jackson, Mississippi. S&H takes delivery of an ADF Systems 550 Power Flush Cabinet to remove FOD from complex machined parts. S&H receives the 2011 Premier Supplier Award from Eaton Corporation. This is the fourth consecutive year that S&H has received this prestigious award, and they continue to set World Class levels of performance in Quality, On Time Delivery, and Value Added Services. Ken Fisher celebrates 50 Years of excellence and leadership at S&H Machine! S&H takes delivery of a Mori-Seiki NMV5000 DCG 5-Axis Vertical Machining Center. S&H takes delivery of another 50-Taper Toyoda FV1365 Vertical Machining Center with a full 4th Axis Tsudokoma Rotary Table. S&H surpasses $8,000,000.00 in annual sales for the first time in its history! S&H ends the year with $8,589,306.00 in annual sales. S&H acquires Melkes Machine adding this site to the S&H family, increasing the total square footage to 45,500 while adding 32 additional CNC machines and an additional 20 employees. S&H receives its first purchase order from Parker Aerospace Hydraulic Systems Division. S&H receives its first purchase order from Space Exploration Technologies. S&H receives its first purchase order from Barnes Aerospace. S&H receives its first purchase order from GE Aviation Systems – Yakima. S&H receives its first purchase order from Moog Aircraft Group. S&H surpasses key milestone and achieves $1,008,069.00 in sales for the first time in its history in the month of August! S&H receives a purchase order from Eaton Aerospace Fuel Systems in Irvine, California to develop an Impeller for the Boeing KC-46 Super Tanker program. S&H achieves $1,049,068.00 in sales in one month during September and surpasses the one million dollar mark for the second straight month! S&H surpasses Year 2012 Sales total! Year-to-Date sales are $8,651,000.00. S&H achieves $1,001,147.00 in sales for the month of October and surpasses the one million dollar mark for the third straight month! S&H surpasses $9,000,000.00 in sales for the first time in it’s history! S&H achieves $1,032,698.00 in sales for the month of November and surpasses the one million dollar mark for the fourth straight month! S&H surpasses $10,000,000.00 in sales for the first time in it’s history! S&H achieves sales of $10,586,440.28 in Year 2013! This represents a sales increase of 22.99% from Year 2012. S&H signs a long term purchasing agreement (LTA) with Moog Aircraft Group. Q1 Sales surpass expectations as S&H achieves $2,865,568.00 in Sales. Q2 Sales surpass expectations as S&H achieves $2,905,690.00 in Sales. S&H signs a long term purchasing agreement (LTA) with GE Aviation Mechanical Systems in Yakima, Washington, which was recently acquired by Triumph Group. S&H signs a long term purchasing agreement (LTA) with Woodward, Inc., to manufacture complex machined parts for the Airbus A320neo and GE Passport 20 platforms. S&H and Parker Aerospace Hydraulic Systems Division in Kalamazoo, Michigan continue to expand their business relationship. Q3 Sales surpass expectations as S&H achieves $3,032,731.00 in Sales. S&H closes the year with a new mark for annual sales, $11,571,045.00, which represent a nine percent increase from the previous year. 2015 marks a shift away from the traditional “job shop” business model, embarking on a journey to transform S&H into a world class long term contract manufacturer. S&H purchases two new Matsuura MX-520 5-axis CNC Vertical Machining Centers. Trunnion style “stand alone” units, the MX-520 increases the working envelope of S&H capabilities. Sales performance over the first three quarters are up an average of sixteen percent (+16%) from the previous year. S&H installs a new Mitutoyo CRYSTA-Apex 5-Axis CNC CMM with a Renishaw REVO probe. 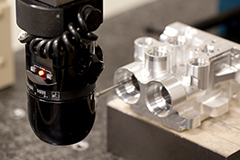 The REVO probe allows ultra-high-speed 5-axis scanning for helical, gasket and sweeping sampling of up to 4,000 points per second. This facilitates access to complex workpieces and increases throughout during inspection measurement. S&H sets new sales records after closing out the month of November, surpassing $12,000,000.00 in annual sales for the first time, and setting a new monthly sales mark with $1,260,363.00 in transactions. S&H closes yet another successful year. Sales for 2015 saw an increase of sixteen percent (+16%) from the previous year, transacting $13,418,081.00 in Sales. S&H rolls out In-Process Inspection Plans in support of their enterprise-wide Continuous Improvement initiative. Q1 Sales in 2016 surpass Q1 performance of 2015 by 19.5%. S&H builds a new Assembly room to streamline sub-assembly and laser marking tasks. Complete with four workstations and KPI and MAP Schedule monitors. S&H purchases a new Doosan Puma GT2100B CNC Lathe. S&H purchases a new Doosan DNM500 II CNC Mill. S&H purchases a Bruker S1 Titan XRF raw material analysis gun to verify raw material composition. H1 Sales in 2016 surpass H1 performance from 2015 by 10%. S&H builds it’s first dedicated manufacturing cell to support the Leap X Engine program. S&H purchases it’s second new Amada HA-250 band saw. S&H purchases a new Trumpf Trumark 505o Laser Marking Machine. S&H purchases a third Matsuura MX-520 5-axis CNC Vertical Machining Center. S&H surpasses $14,000,000.00 in sales for the first time in it’s history! S&H ends 2016 with $14,341,067.00 in Sales, a 7% percent increase from the previous year. S&H invests in a Doosan NHP 4000 Horizontal Machining Center. This equipment will support a key customer in the UK, running a family of machined parts that are critical to sensing systems that measure engine temperature, engine speed and engine pressure. S&H invests in a United Surface Solutions CPC4000 HD Centrifugal Barrel Finishing system. This automated deburring machine will help S&H increase throughput and eliminate dependency on hand finishing critical machined parts. S&H invests in the Carl Zeiss O-Inspect 322 multi-sensor vision system to reduce measuring time and increase accuracy. This machine enables optimal characteristic measurement, uniting both optical and contact measuring technology in a single system. In 2018 Yvonne Ha joins the S&H Management Team as Finance Manager. She holds a Bachelor of Science degree in Finance from California State University, Northridge.